Our office secretary Diana got married last week and our team wanted to surprise her at the registry office. 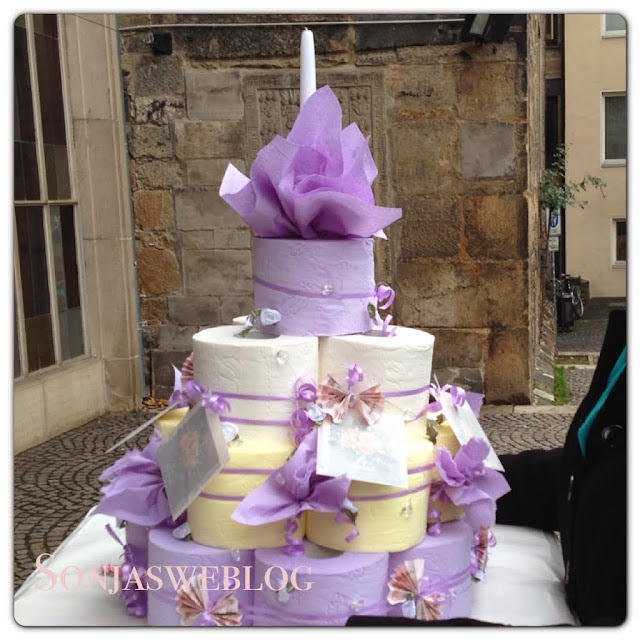 So lovely Angie, our new colleague, came up with a creative idea to present our wedding gift: She bought scented toilet paper in three different colours, white, yellow and purple. With purple ribbon she tied the paper rolls together, 7 rolls for the first "cake layer", 5 for the second layer, 3 for the third layer and one roll for the top part. She piled them and placed a purple napkin with a white candle on top, added some transparent beads and little artificial flowers too. Then each of us wrote a mini greeting card. The cards were fixed to the ribbon as well as the banknotes which were folded into little bows/ butterflies. Our wedding "cake" was done! I loved the creativity and Angie's great idea. And Diana and her husband were really surprised to see the whole gang in the registry office with a purple something. So our surprise worked!